Welcome to the Rollins World Wide Web page and domain. This page has several interesting items, as well as links to many varied sites. Please, e-mail us your comments - good or bad - to "page@mrollins.com"
I have not updated this page in a while, as not much has changed. All kits (as of 2015-01-14) are still available. Yes, the e-mail is down (2004-09-29). I won't say Cleartel is incompetent, (although in slander or liebel cases truth is the sole defense) but it was interesting that earlier problems blamed on "the hurricane" happened before any hurricane! Over two weeks with no e-mail and there was no end in sight. Well before 2004-10-01 we should be transferred over and up and running at Go Daddy. These folks answer the phone 24/7, host at a good price, speak English, and actually seem to know what they're doing. As an e-mail alternative (although I do not check it a lot) you can try this e-mail address. New Millenium, new PDA. My venerable Newton was replaced by a Sony Clie (Palm) UX50. That's it with a Sony/Ericcson T-610 phone, so you can see how small it is. It is a clamshell design where you can also twist the screen to make it a tablet. Built in still- and movie-camera, WiFi, BlueTooth, half-gigabyte MemoryStick, it's nerdvana. 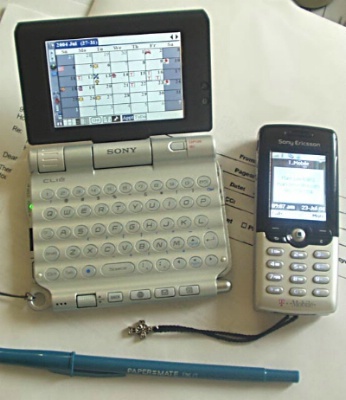 True to form (like Apple with the Newton), Sony announced about 2 hours after I received mine that they were not going to sell Palm-based PDAs in the US anymore. Also have a new photoBLOG. Silly, sick and opinionated. Model Railroading - model railroad information, complete with model railroad circuit diagrams. NewtonMania! - how I use my Newton MessagePad 2100; tips and tricks, Newton software reviews. Other - a collection of interesting stuff. Created on a Macintosh powered by Motorola & IBM; made with PageMill from Adobe.